Beginning in the late 1950s, the version of Superman that is most famous today began to take shape. 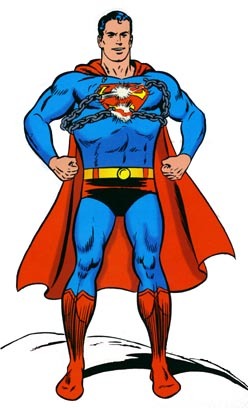 This Superman and his successor, the Bronze Age Superman, are both generally referred to as the Superman of Earth 1. 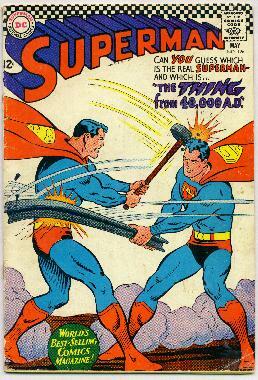 Two events occurred at DC Comics about this time which contributed to a redefining of the character. First, editorial duties at DC Comics were redistributed, giving Mort Weisinger sole control over the character. This allowed for a much tighter control of the stories and resulted in the developing of the "Superman legend," the first serious attempt at a constantly developing continuity in comics history. An instrumental force behind this development was Jerry Siegel, who had returned to DC in 1959 to write the adventures of his creation once more. Weisinger and Siegel, together with science fiction greats Edmond Hamilton and Otto Binder, set out to clearly define the personalities of the characters in the Superman mythos, fleshing out the formerly cardboard cutouts into three dimensional human beings. A lot of this continuity was retroactive, as aspects of Superman's adult life were now shown to have antecedents in his childhood. Thus, in Adventure #271 (Apr. 1960) we learn for the first time that the enmity between Superman and Lex Luthor (here given a first name for the first time in the chronicles) extends back until they were teenagers, and that Luthor, until now a fairly run-of-the-mill mad scientist type, is actually motivated solely by personal hatred for the Man of Tomorrow. Under the guidance of Weisinger and Siegel, Luthor slowly evolved into a truly three dimensional character, at once capable of the most self serving cruelty, and the ultimate noble sacrifice, depending for the most part on whether or not Superman is involved. Driven solely by his desire to prove once and for all his superiority to the Metropolis Marvel, Luthor's character is clearly sketched in Jerry Siegel's classic "Death of Superman" tale (Superman #149, January, 1960). Who could forget Luthor's trial in Kandor, when the man grinned and gloated throughout the proceedings, confident that he would be proclaimed a hero once he offered to enlarge Kandor to full size again, and his uncomprehending horror when his offer was turned down? Despite the fact that previous continuity was being contradicted, many other adult relationships were extended into Superboy's day. In January of 1960, (Superboy #78) he met Mister Mxyzptlk. In August he met Bruce Wayne for the first time, in a text that established that Kal-El knew he would grow up to be Batman (Adventure #275). In January 1961, Superboy met Lori Lemaris, although the story was contrived so that neither of them would remember the incident (Adventure #280). With the advent of annuals which allowed readers greatly increased access to Superman's past, continuity became increasingly more important. It soon became clear that, as far as the editors were concerned, this continuity began in 1958. Few stories from before that period were ever reprinted. Earlier events were blithely contradicted or reused in new stories with no reference to their predecessors. 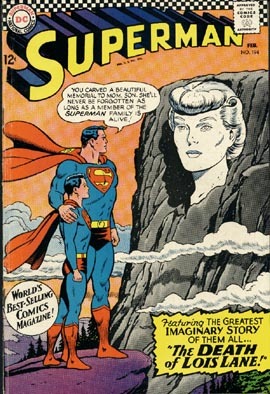 Thus, August 1953's Adventure Comics story was offered up in November 1961 as the first Sun Boy story. 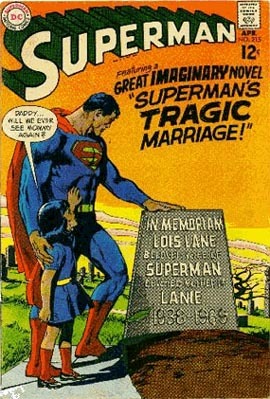 Similarly, in March 1961, Lana Lang's 1953 romance with Mars Boy became the first Star Boy adventure. 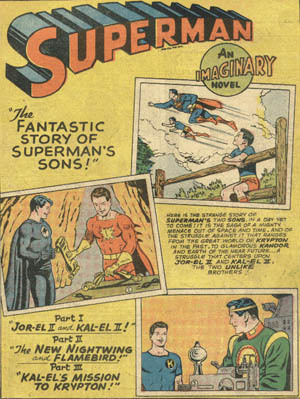 The January 1953 story "Superman's Lost Brother" (Superman #80) is word for word almost identical to the March 1961 introduction of Mon-El (Superboy #89). 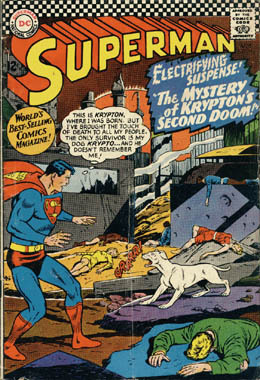 Although Jerry Siegel's 1960 classic "Superman Returns to Krypton" has been reprinted several times, and referenced as recently as the World of Krypton mini-series, previous meetings between Superman and his parents, such as August 1958's story with the same title, have been completely ignored. 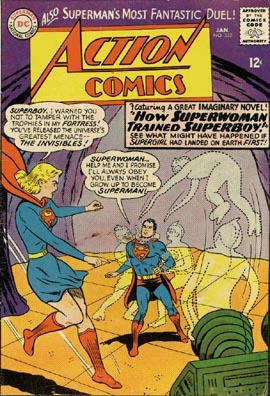 The new era brought many other innovations to the Superman saga, such as the first completely autonomous Superman robots (Feb. 1960). These innovations were usually retrograded into Superboy's time, thus invalidating previously established events. These changes, drastic though they may have been, produced a much tighter, more fan oriented, version of the Superman chronicles. The addition of letters pages prompted readers to ask questions and demand logical explanations for things which had been taken for granted for years, such as where did Superman put his Clark Kent clothes when he changed? or Why was Superman's costume indestructible? Under this tighter scrutiny, a new explanation for Superman's powers began to develop. For the first time, in Action #262 (March 1960) the notion that Superman's powers derive from yellow sun radiation appears. Such an additional source of power appeared to be necessary because Earth's lesser gravity did not seem sufficient to explain how Superman could change direction in mid-air, fly through space, or exceed the speed of light. Around this time, a continuing series of adventures concerning Kal-El's life on Krypton established that he was at least three years old and already fluent in Kryptonese before the explosion that destroyed his planet. No more would he spend the first decades of his life wondering where he came from and why he was so different. He remembered!